After several times of speculation, those from Motorola have finally made the effort to officially launch the new Moto G, a descendant of the expensive Moto X. While there were long talks about the launch of the new Moto G, during this period is good to know that at least in the U.S., the event took place, and with a little luck, it should arrive all over the world. In principle, although most rumors have been confirmed and we will not have a revolutionary surprise, we must not neglect official specifications accompanying this release. 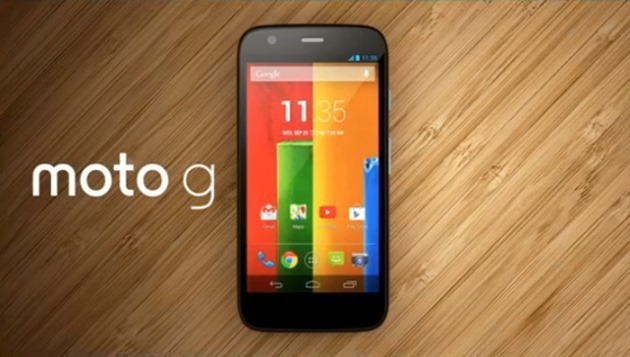 Motorola Moto G is a smartphone with a 4.5 inch HD panel which is limited to a 720p native resolution. The processing is provided by a combination of a quad core SoC at 1.2 GHz Qualcomm Snapdragon 400 and 8 GB of internal memory. The main camera is 5 megapixels, and the preinstalled operating system is not the last one released by Google. Currently, we are only talking about Android 4.3 Jelly Bean which will be upgraded in early 2014 to KitKat. In the U.S., the new device described above will be priced at $179 for 8GB version and $199 for the 16GB internal memory. On the customization of the phone will be available no more than 19 possibilities to personalize Moto G’s behind using some gadgets called Motorola Shell, Flip Shells and Grip Shells of different colors. The propagation of the new gadget in the world will take place in stages. Initially, it will start with Brazil, following some European countries, Canada and the UK to benefit from the same treatment in the coming weeks. An interesting move, to how things were done before, is to launch these phones in the U.S. and India at the beginning of 2014.